Shuttle bus services go from Weeze Airport in Germany to several Dutch cities including Nijmegen, Arnhem, and Venlo. Change in Nijmegen to the train for Utrecht and Amsterdam. Weeze Airport in Germany is only around 2 km from the Dutch border. Many travelers from the Netherlands therefore also enjoy the cheap flights available on low-cost airlines such as Ryanair from Weeze Airport (NRN). Shuttle bus services from Weeze Airport are available year round to Venlo, Nijmegen, and Arnhem. Seasonally, further services are also available to other cities, or change in Nijmegen for the train to for example Utrecht and Amsterdam. The airport transportation services to the Netherlands are now mostly on shared minibus vans on which advance reservations are almost always required. Private transfer services are convenient and for small groups may even be cheaper than shuttle buses. Expect to pay for private airport transfers from Weeze Airport to Venlo around €50, Nijmegen €90, Arnhem €100, and around €300 to Amsterdam (if available). Several services are available making it worth comparing online before booking. Taxi2Airport and Suntransfers give online quotations for private airport transfers without first requiring personal details or flight numbers. Airport transfers between Weeze Airport and the Dutch cities Arnhem, Nijmegen and Venlo are operated by Airport Weeze Shuttle using mostly Cox Taxi minivans. Reservations at least 24h in advance are essential. The service from Nijmegen is a typical shuttle bus service running according to the timetable. Depending on the day, there may be up to 10 services. The journey time is 45 minutes and cost €18 one way and €30 return. The Airport Weeze Shuttle bus stop at the airport is Stop 5 while the bus stop in Nijmegen is at the main train station in front of the Hotel Restaurant Mercure. The service to Arnhem (70 minutes) and Venlo (45 minutes) are in smaller minivans and mostly operate according to demand. Prices range from €10 if six people book to €45 for a solo passenger between Venlo and Weeze and from €18 if six people book to €90 for a solo passenger for travel from Arnhem. The airport shuttle stops at the Gelredome McDonals’d parking in Arnhem and in Venlo at the “Kiss&Ride” of the Central Station. Trains are also an option when traveling from Weeze Airport to Venlo but traveling times will be significantly longer. See By Train to Weeze Airport for details including using the cheap Schöner-Tag-Ticket NRW. 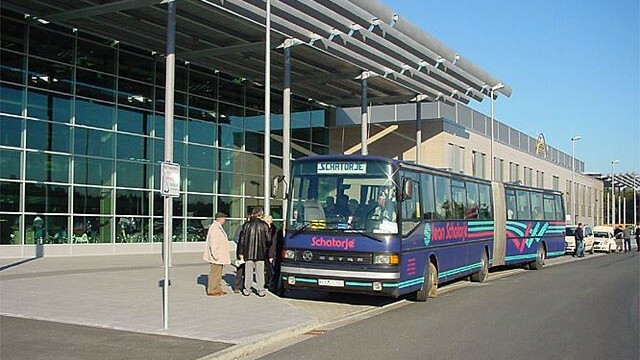 Bus services sporadically operated from Weeze Airport to Amsterdam, usually via Den Bosch, Utrecht and Eindhoven, but no bus service is currently available. The train is the best option from Weeze to Amsterdam and other cities in Holland and other provinces further away from the German border. Nijmegen is usually the easiest city for changing to Dutch railways trains. Check the timetables for buses and trains from Weeze Airport online at Deutsche Bahn (German Railways) for departures from from Airport Terminal, Weeze or journeys to Weeze Airport. Traveling via Düsseldorf is usually the simplest, but other options may be faster but require more transfers.